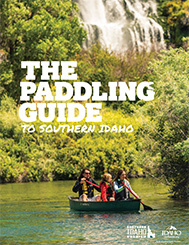 Southern Idaho’s Snake River offers endless opportunities for people who love water sports — quiet SUP excursions, roaring whitewater, peaceful lakes, or down-to-the-wire boat races. 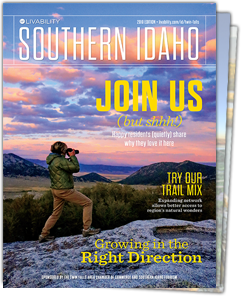 Here’s a roundup of Southern Idaho’s most popular spots. Idaho Regatta – Thousands of spectators turn out each year for the Idaho Regatta on the Snake River near Burley. Since 1975, this race has been attracting folks who line the riverbank to watch speed boats zoom across the river in head-to-head competition at speeds exceeding 120 miles per hour. Racers in eight different boat classes will make three laps on a 1.25 mile race course in the qualifying heats, and in the final races on Sunday, they’ll make four laps. The Idaho Regatta is part of seven-race circuit for speedboats throughout the United States, so you’ll be seeing the best of the best. WARP Racing – Every summer, this sprintboat track along the Snake River in Burley buzzes with excitement as hundreds of people gather for regular races. Some of the fastest boats in the United States can be found during WARP races — plus, if you’re into speed, you’ll find additional races on land at WARP’s motocross track. Snake River in Burley/Heyburn – Poised on the river’s edge, Burley and Heyburn provide access to some of the most popular shoreline on the Snake River. Riverfront Park and North Freedom Park in Burley have boat ramp access for water skiing and boating, while Idaho Water Sports offers a riverside rental venue at the docks in Heyburn for SUPs, kayaks, and pontoons. Lake Walcott – Lake Walcott State Park is a hidden treasure chock full of outdoor amenities. The park is situated next to Minidoka Dam on the Snake River. The dam, one of many built in Southern Idaho to bring the desert into bloom, creates 17-mile-long Lake Walcott, a popular hangout for water skiers, jet skiers, stand-up paddleboarders, and even sailors. On days with little or no wind, it’s a great place to kayak and canoe. The lake recently upgraded to two 60-foot-long docks, which makes getting onto the water even easier. Murtaugh – Murtaugh Lake Park, set on a peninsula on its namesake lake, is a haven for people who love to fish — expect to find catfish, bluegill, perch, and even bass. Twin Falls County Waterfront Park, also known as “The Cove,” is located on the west end of the lake. Boating is very popular on Murtaugh Lake: You’ll find plenty of boat launches, day shelters, and places to camp if you want to make a weekend of it. Salmon Dam Reservoir – This longtime favorite — the lake was created in 1910 when Salmon Falls Dam was built — is a tried-and-true hotspot for boaters. But it’s especially great if you’re combining your boating with a bit of fishing: This reservoir is the premier walleye fishery in Idaho. Thousand Springs – Take your own boat out on this waterfall-laden stretch of the Snake River or let a tour guide do it for you! Hagerman-based 1,000 Springs Boat Tours runs year-round excursions on an enclosed, 52-foot catamaran called The River’s Mist. Murtaugh Reach – Big-water lovers flock to the Murtaugh Reach of the Snake, a series of incredibly technical rapids. This stretch of water is best left to experienced rafters, kayakers, and guides, though: It’s rated Class 4.5 to 5 throughout and includes the near-impossible Cauldron Linn, a stunning waterfall that explorers first tried to run in 1811. (They were unsuccessful.) During high-water years, however, the Murtaugh Reach is overrun with kayakers who take advantage of the big water.